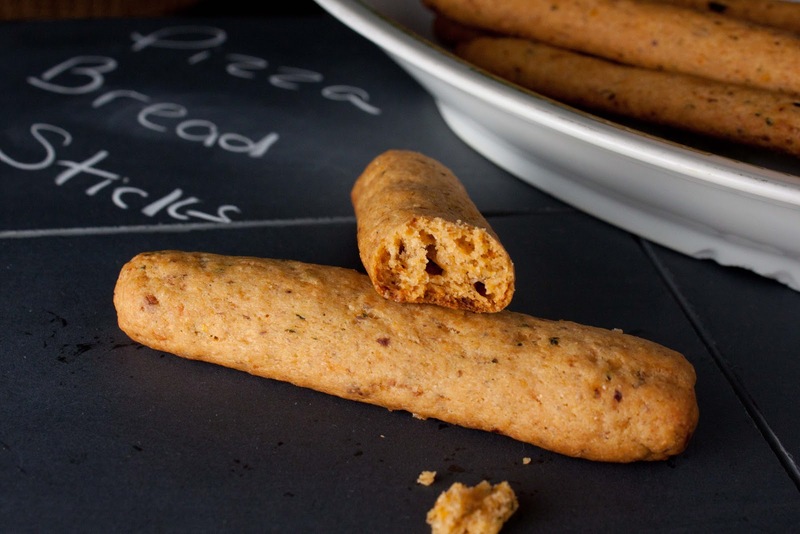 This pizza breadstick is somewhere between a bruschetta and a grissini (breadstick.) It's perfect to complete a salad or as an addition to an hors d'oeuvres table. A simple Fat and Happy pizza stick recipe to add to the pizza collection. Please take a moment to view all of my fellow food bloggers pizza creations below. Fat and Happy Food Blog Tips and Techniques: Make hundreds of variations on this recipe by changing the cheese, herb and other ingredients. Roll them long and thin or short and fat, just depends on your preference. Place the flour, salt, baking powder, oregano, sun dried tomatoes and olives in the food processor; pulse to combine and cut up the ingredients. Pulse while drizzling in the olive oil. Continue to pulse while slowly adding small spoons of water in, be careful to not dump in all the water. The dough will combine into a ball, only add enough water for this to happen. Pulse the dough a bit after each water addition to see if it comes together before adding more. The dough will be somewhat moist. Place the dough on the counter, cut it into equal parts and roll each section out on a lightly floured surface. You should be able to get 12 breadsticks, depending on how long you roll them out. Place on an ungreased cookie sheet. Wrapping a thin slice of prosciutto around the bread stick is optional at this point but it's so damn delicious when it bakes into a crunch bite. Carefully hold up one end of the rolled stick and lightly wrap a thin piece of prosciutto around it the best you can. Bake until the the bread sticks become slightly browned; for a crunchy breadstick this took 25 minutes in my oven. For a softer pizza breadstick remove them at about 22 minutes. Allow to cool slightly on the pan then enjoy. These look wonderful Monique! So far we've all stayed close to home on the original recipe and there is no question why! Such soul-satisfying food like this deserves its day. I have never make pizza sticks and would love to try to make your recipe gluten free. I also wonder if you could pipe something (a filling) into them? That might be overkill but as you said they seem perfectly versatile and I love those types of recipes! Your breadsticks would be a perfect meal on their own for me tonight. Your grilled flatbread pizzas are also some of the best looking ones I have seen. One of these days, I'm just going to have to finally try grilling a pizza. Yum! Breadsticks are so delicious, and I LOVE the flavors you included in yours. These seem fancy enough for a party and down-home enough for a night in front of the television. Great interpretation of the original recipe! Is there anything better than a tasty breadstick wrapped in prosciutto? I'm in love with your post (shame I can't bake them at the moment). Oh my goodness I highly approve of this recipe ;) I had some amazing gluten-full breadsticks at an Italian joint a few weeks ago (worth it) and need to make a gluten-free option, so this recipe is going on that list. Awesome versatile recipe to have in the box - thanks! Yum! 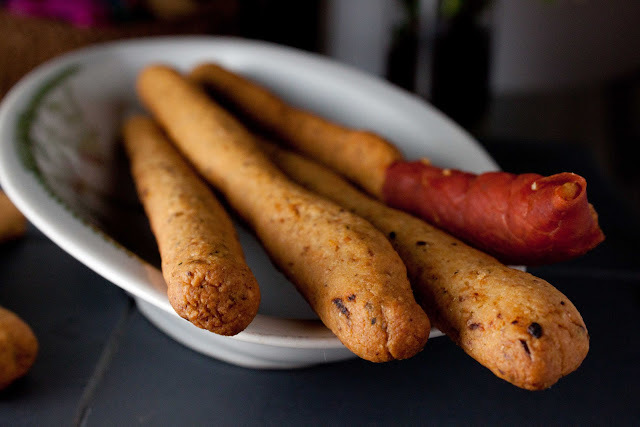 these remind my of pizza breadsticks we used to get from the Pizzacheria in Italy - lovely memories and a lovely recipe! Okay - how cool are you? Pizza Bread sticks? Brilliant! They also look delicious! too good. I can feel the crunch just from the picture. I love how you rolled it all up into one! And wrapping things in prosciutto doesn't hurt either. I would love a bouquet of those bread sticks on my dinner table tonight! They sound awesome! I'm always making pizza but have never tried making breadsticks. You have me convinced to give them a go! I adore grilled flatbread pizzas also! These things would disappear in minutes at my house, especially wrapped in prosciutto, my husband would go NUTS for them!! !